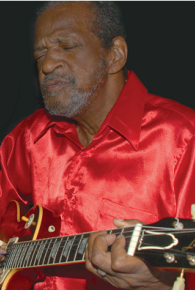 Although Fred Sanders was born in Memphis in 1939 to a musical family, it took leaving his home in order to find the Blues. He left Manassas High School and served in the military in Corpus Christi, Texas from 1957 to 1959. Out of the service, but still in Texas, he explored the many facets of Blues guitar beyond the simple chords he learned early on from his older brother. Soon he was part of the Texas Blues scene and remained so until he returned home to Memphis in 1968. Fred was then hired as a staff guitarist for the world famous Club Paradise. During his seven-year tenure at the club, he played with B.B. King, Bobby Blue Bland, Albert King, and many others. During the mid-1970s when the blues remained mainly underground and records were hard to find, Fred jammed at the Blues Alley on #1 Beale. Despite the lean years, Fred refused to turn his back to the Blues. Instead, he continued to work hard to help keep the Blues alive. Fred was also a member of The Memphis Blues Caravan and toured worldwide, and played with Duke Ellington’s Orchestra, Count Bassie’s Band, Buddy, Rich, and Johnny Taylor among others. For the past eighteen years, Fred has been a staple of the Beale Street scene, and on nice days if you are lucky, you can still catch him live at W.C. Handy Park.